This falls into the "What would you do" category. My awning and I have never made friends. Partly my fault, but not this time. Here's the problem. When I roll up the awning, no matter if I do a zig-zag on the tape or wind it to the front or rear, it always ends the same. The front awning clamp (the thing with the wheel) aligns perfectly, while the rear one is about 5/8" too high. In order to get the wheel and it's bolt to latch I need to push up on the roller with a pole. 1. It's under warranty, let the dealer fix it----except I'm paranoid about a leak because he'll just move the clamp into new holes. 2. 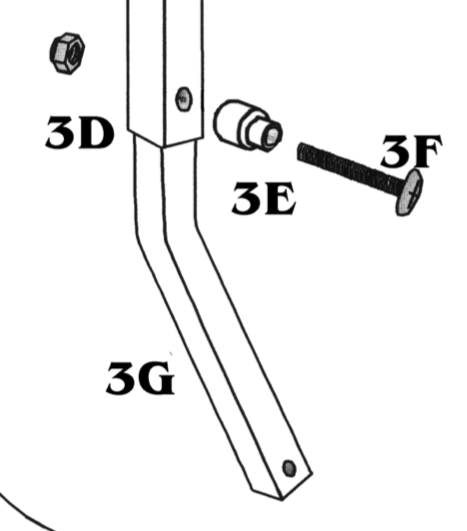 Buy the lower bracket arm from Zipdee, (It's called the lower hinge bar) it's the piece from the trailer to the arm. About a foot long. Then, plug the holes and drill new holes 5/8" farther up, therefore raising the arm and roller when retracted. The problem with this is the travel lock won't align without pulling. (It's called the travel latch hook) It doesn't hook now without pulling on it. It's an issue not covered in the videos, "When things don't work like they're supposed to"
I don't use the awning much, but it's never been right. I used to attribute it to the trailer being out of level, but I've experimented many, many times while on a level concrete parking lot, and the result is always the same. Sorry, no creativity here. I would take it back and have them fix it. Share your concerns about possible leaks and listen to what they say. Do you trust these guys? And, you second option still requires removing a bracket and redriling holes. What is the diff? The problem with any dealer is you never talk to the tech who will actually work on it. You talk to a service advisor, who fills out a work order and the tech may or may not think your concerns are worth his attention. Ideally, I'd like to talk to the tech and ask his advice. He might say, "I do this all the time, don't worry!" The second option has me replacing one of the arm parts with one I modified making it slightly longer, no drilling into the Airstream skin. I didn't make myself clear, I guess. Option 1: Move this clamp screwed to the roof. Or, Option 2: Make this a bit longer by redrilling new upper holes. Pardon my yakking, but it looks like moving the bracket (the correct solution since the travel hook will then align) will still have the old holes under the bracket, and it has three screws, I thought it was one screw and two rivets. I need to see it again. Just because Zipdee designed it with three screws doesn't mean Airstream actually did it that way. For small adjustments, the bend in the arm cam be changed (bent) to extend the arm slightly. Contact ZipDee with your concern and find out what they say. ...The front awning clamp (the thing with the wheel) aligns perfectly, while the rear one is about 5/8" too high. In order to get the wheel and it's bolt to latch I need to push up on the roller with a pole. 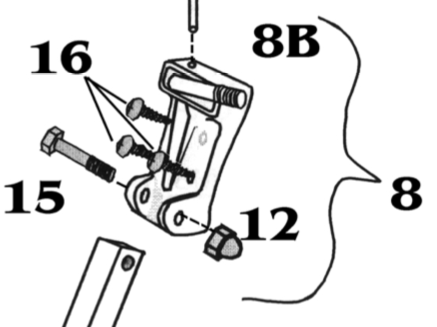 If I understand, you need to raise the aft end of the awning so the wheel latch will go into the bracket. Are you going to have to weld up the existing holes in the arm. Or is the move sufficently far? I would not get the dealer to drill new holes in the trailer skin. I would try the arm approach or have a couple of beers and just live with it. It sounds like you can close it up fine with extra effort. Weld? No. I was thinking of inserting a bolt snugly in the existing hole 5/16"? and cutting it off flush. Being dissimilar metals, it would weld itself over time. I would not get the dealer to drill new holes in the trailer skin. The only way, looking at the diagram above is that part #12 (the upper clamp) looks like it would still cover the existing holes. We have a similar situation (if I read correctly) and I found that pushing the arm assembly closer to the side of the airstream helps lift it up and align it with the wheel assembly. That works in the front but in the back it's like it's already under tension and doesn't want to push in. All good ideas! Thanks, keep them coming! What if you try the rear awning arm first - shouldn’t be under tension then. You can download the installation instructions and use them to measure if anything is installed wrong. The first step is to measure down from the awning rail a given distance to the lower brackets. Then the upper brackets are mounted directly above the lower ones with the main arms setting the height. You might be able to figure out if one of the components was installed in the wrong spot. When facing an awning, the left arm is the one with the spring... it will spin out of control if you take it loose and aren't very careful!